When training your dog with reward based methods, making the dog thoughtful by coercion is not an option. There are better ways to train your dog to use his brain, really listen for what you’re saying, and to avoid anticipation and keep the level of arousal just right. Varying what you ask your dog to do in an unpredictable manner makes you keep the initiative. Therefore I teach my dogs several different reward markers. It’s not only practical in training that the dog knows which kind of reward to expect when, but it’s also allows me to develop a great working relationship where my dog turns to me to ask for guidance. Another advantage is that it is great stimulus control training. 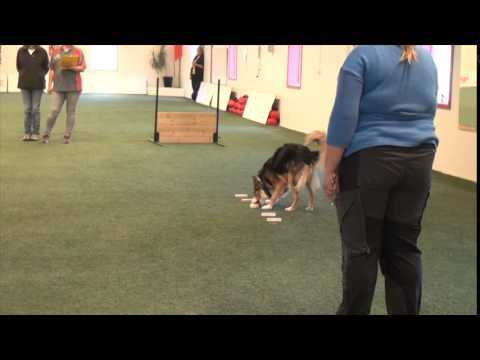 When the dog knows the different cues and reward markers, I test the dog’s understanding by giving the cue the dog doesn’t expect. It’s important that my cues start and end the different behaviors. Anticipating or guessing should not pay off. Switching between behaviors and a lot other tips on how to develop your relationship in training and everyday life will be covered in the new online class Relationship building starting Nov 1st. 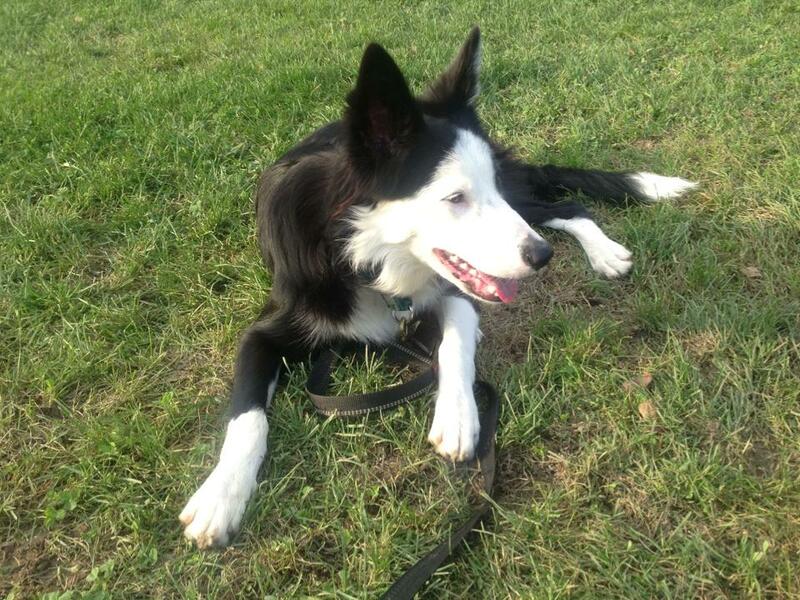 Wilco and I had a fun day yesterday, with a lot of obedience training. Since Squid is in heat, I decided to focus on Wilco in every session with our training group. He is really starting to mature. He was able to focus for the entire day, and he’s got more power and speed than before. We started experimenting with adding distractions when he is sitting by my side and looking up. I’ve been feeding him in position before, but I’ve never interrupted him for looking away, only for moving. I don’t think he’s been mature enough for this before, but now I really felt that I got exactly the result I wanted. The important thing here is not how he performs the behavior, but rather how he is handling being interrupted and having to try again. I want my dog to be engaged in the interruption, and very eager to try again. It should matter to them when they miss out on a reward, but I don’t want to see any displacement behaviors or avoidance. I want the dog to bounce back immediately and work hard to get it right the next time. Wilco gets quite intense when I interrupt him, but he is doing a great job in going back to calm and focus quickly. With a dog that struggles more with this, I’d probably be moving all the time, and work on focus in motion (walking backwards or with the dog at heel). Remember that this is a process, and with some dogs, you really have to reward them just for trying again. It could be rewarding the over-aroused dog right away for sitting down after the interruption, shaping the response that you want. Or it could be rewarding the more cautious dog for engaging in the no-reward routine, without asking for anything more than that they don’t give up. When Squid was young, I taught her to steal the toy away from me when I did my “haha”-routine. I worked only on the routine, until I got the right emotional response to it. Working on the best possible emotional response to different interruptive routines is important! We put a lot of work into creating a great emotional response to our different kinds of rewards, but this is just as important if you want to be able to mark incorrect performances (for example in a behavior chain or when working on duration) and by that increase the likelihood that the dog will try again with great attitude. I mostly use this kind of cheerful interruption (term stolen from Denise Fenzi) in well planned sessions, where the choice is an easy yes/no, and if I use distractions I like them to be planned. I think that the rituals would lose a lot of power if I used them all the time to get the dog to try harder. Most of the time in training, just withholding the reward and waiting for them to try again is the best way to handle wrong responses. Wilco turned 8 months last week. That means that he’s lived with us for over half a year. Wilco is a very nice little dog. He’s got many traits that I really like. First of all, he’s kind and social with everybody. Meeting new dogs always means that he wags his tail and hopes to start a new friendship. He likes people, but is calm and balanced when greeting them. Although he is happy and friendly, it’s hard to get him to lose focus in training. He is not triggered by other dogs moving fast or playing, so there’s never a problem with training him close to other teams. He is also very good at waiting for his turn when others train (although I have to admit he could be better at waiting for his turn when I train the other dogs). He easily relaxes when nothing happens, bot outdoors and indoors. I also think that he has a very nice build and a balanced structure that he uses well. He’ll probably end up a bit taller than Squid and Epic. He’s got tall legs and a short and strong back. I like these traits a lot in a border collie. I feel very lucky! I read a Swedish blog by Maria Brandel last week, on how every dog is different and how it’s not dangerous to be ready for competition early, but also how you shouldn’t be stressed out if your dog needs more time. I totally agree, of course. It’s not a bad idea to wait if you feel like your puppy isn’t ready for what you want to teach. Wilco learns quickly and has good focus, but there are still things that I don’t think he is ready for. He is stilla puppy, and he doesn’t have the power and strength of an adult dog. Wilco’s father Epic was another type when he was young – he matured early and has always been very powerful. I’ve always compared Epic to at typical “jock”. Physically capable, strong, hardy and with a lot of confidence. I don’t think he’s grown out of that role yet. Squid was a very different young dog. She was clever and learned a lot of behaviors, but she had a lot of trouble with other things. She couldn’t do anything with power and speed. She stopped working if anything went wrong. I couldn’t do much duration work or trial prep, because she’s get very worried if anything went wrong. When she was about 14 months old, I took her to the vet to make sure that she was healthy. She was, but we had to let obedience wait for quite a long time, while we did other things. Agility was easier, but it took some time before she really got excited about doing it, and I had to build her confidence in jumping very slowly. Wilco is somewhere between his father Epic and his aunt Squid. He isn’t as sensitive and slow as Squid, but also doesn’t have the power and confidence of his father. He is mature in some ways, but still a puppy in other aspects. With Squid’s journey fresh in my memory, I’m not worried that I won’t get speed and confidence in Wilco. I just enjoy developing the things that I feel that he’s ready to do. A balance between games for speed, physical conditioning, shaping and skills for obedience and agility. There are things that I haven’t felt like there is much point in working on yet – for example a formal retrieve or send to box. When I started with Squid, I planned to teach her send to square early. It took me an extra year before I felt she was ready. When I started training, it took me 9 minutes to get her to find the box with her eyes and run there in full speed without any prompts. I don’t regret waiting! Last weekend, we went to a regular elite competition, and had a good run. 293,5 points and our first “excellent” score towards the championship title. I’d planned for three more competitions this month, but Squid just came into heat and we have to cancel those trials. If you’re interested in the way we’re training obedience, you should check out our Foundation Class Online. We’re still on the first lesson, so you can join us and easily catch up if you want to learn more.